Does China Want to Be a Powerful Player in the Gold Market? Home » Does China Want to Be The Most Powerful Player in the Gold Market? Does China Want to Be The Most Powerful Player in the Gold Market? The Chinese have taken another tremendous step to insert themselves into the gold market. What’s the end game to these maneuvers? China does nothing without a reason. Lately, that reason has a lot to do with gold and the gold market. 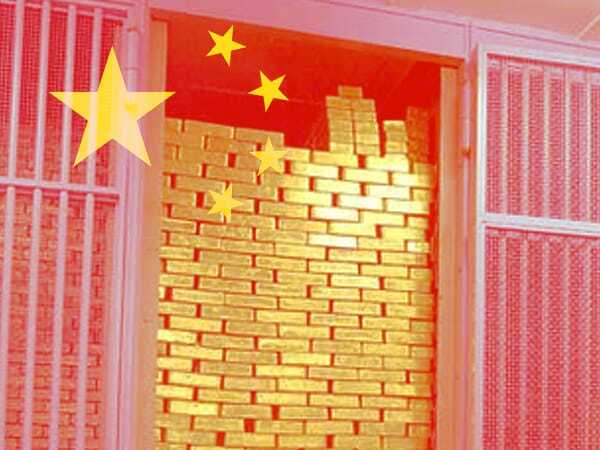 This week, a bank in the communist “managed market” country seized further control over the precious metals market by buying one of the largest gold vaults in London. This comes on the heels of the government announcing gold reserves a few months back that were much larger than the last official figures. In fact, Chinese gold stocks are most likely vastly under-reported. China has also launched a gold price index to insert itself more forcefully in the gold markets on a daily basis. The secret vault in London, bought by the huge Chinese ICBC Standard Bank, reportedly can hold up to 2,000 metric tons of gold and other precious metals. It took over a year to build and is one of the largest gold vaults in Europe. Two things are obvious. First, China wants to own a lot of gold — as much as possible. And second, China wants to be an influential player in the worldwide gold market. So why do you think China wants to be so heavily involved in precious metals, specifically gold, in such a myriad of ways? The answer most likely is very simple: China sees what is going on with global finance like everyone else. They see the out of control spending and debt in Europe. They see one of the world’s reserve currencies in grave danger as the European Union threatens to tear itself apart for one reason or another. China sees the out-of-control spending in the United States, the financial irresponsibility of both parties. They see governments failing in Latin America and oil impacting Russia in a very negative way. In short, China sees a world of financial and geopolitical instability. It is very possible the world financial system that has been in place since the end of World War II could be coming apart at the seams. Currencies backed by the current financial regime could be have their value evaporated in a very short period of time. What will be left standing if this happens? Yes, you guessed it, the precious metal that has been a human store of value for thousands of years, from the Romans to the Nazis. China is simply preparing to be the king of the hill when this transition happens from the financial world we know today. The Chinese find tremendous value in gold, as a means to protect their future. Isn’t time you did too? This top investor could be right about gold. Read why here.